Hong Kong, China -- A 500 year-old thangka is just one piece of a treasure trove of Buddhist art that will be on the auction block in New York next month. The works are currently on display at Bonhams in Hong Kong. Sales of Himalayan masterpieces from the 14th to 16th century including a rare thangka, a devotional painting, and a bronze sculpture are among the highlights of a leading auction house's Indian, Himalayan & Southeast Asian Art auction to be held in March in New York. 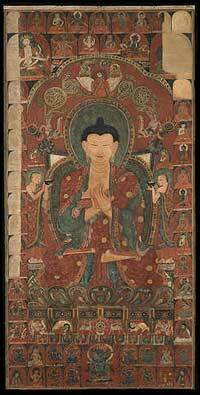 A 500 year-old thangka which is in remarkably good condition, along with other Buddhist exhibits, are being displayed at Bonhams Auctioneers in Hong Kong. The lineage portrait thangka of the Ninth and Tenth Abbots from the Ngor monastery made around 1557, is an extremely rare example of 16th century painting from Central Tibet. The distemper-on-cloth work is boldly coloured, using a primary palette with heavy gold outlining and presents central Buddhist figures seated next to each other. Edward Wilkinson, consultant of Indian, Himalayan and Southeast Asian Art of Bonhams says the thangka is very well preserved because it was only used in special Buddhist ceremonies. "It's in remarkably great condition, excellent condition, and that's because it was rarely exposed to the light, it was rarely used and only brought out for very special commemorative purposes," Wilkinson said. "But the construction of the painting involved the use of grinded mineral pigments, and then with a very specific, careful design that was influenced both by Nepalese craftsmen and by Chinese influence and you can particularly see along the base of the throne here a very distinctive Chinese influence, and the scroll work throughout the red background and the scrolling elements here distinctly from the Nepalese tradition from the early period of 12th and 13th century." Influence from central China can be seen from the use of cloud motifs on the robes of the abbots and the scalloped edge at the bottom of thangka. The inscription on the bottom indicates the thanka was likely made for the installation of the 11th abbot of Ngor monastery in 1557. The thangka is expected to fetch anywhere from eight hundred thousand to 1.2 million US dollars. Another highlight is a gilt copper alloy figure of the prominent composite deity, Chakrasamvara, expected to fetch between five and seven hundred thousand US dollars. The sculpture depicts the eponymous twelve-armed Vajravarahi, a male deity and female deity locked in a passionate embrace. 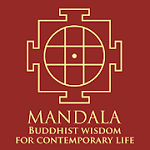 The union of these two qualities presents the most important transcendental ideal expressed in Buddhist art, supreme enlightenment. The sculpture is expertly detailed and both figures are gilded and embellished with jewelry. Wilkinson says buyers of this type of art are from all around the world, although Chinese mainland buyers have played an important role in the Buddhist art market recently. He adds that collectors of Buddhist art are usually not purely motivated by monetary value. 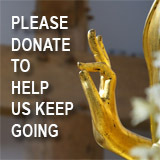 "One likes to think that those who are collecting particularly Buddhist art are little more connected to it and it's not just used as currency as many other luxury goods are, people who buy Buddhist art are actually serious about it, and if they buy a Buddha they don't treat it perhaps as much of a commodity as they would for other luxury class items," Wilkinson said. The items will be auctioned at Bonhams on March the 16th.